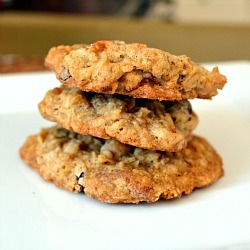 Oooooh!, LOVE the idea of oatmeal AND coconut. I heart coconut! The instructions says ‘cream butter and sugars (plural), but the recipe only has brown sugar – is there an omission in the ingredients? Sharon – thank you SO much. Yes, there was an omission. I used the recipe in The Gourmet Cookbook while I was baking these but used the online recipe while I was writing out the recipe and my modifications. The online recipe omits the white sugar (it is clearly a mistake). I have updated my recipe to include an additional 1/4 cup granulated sugar and will send an email to Epicurious too about their typo! Again, thanks! 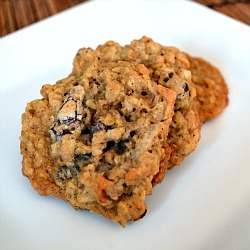 That oatmeal coconut chocolate chip combo sounds like it works really well in these cookies and they look great. I’m starting a new linky on my blog this Saturday called “Sweets for a Saturday,” and I’d like to invite you to stop by if you have a chance and link these up. I, too, need to be forced to slow down!! This is perfect!! I am going to a boston blogger cookie swap and was looking for some coconut chocolate cookies (that kinda taste like almond joys- my fav) so I definitely making these. I think I’ll used chopped almonds in place of the pecans. And the addition of oatmeal will make me believe they are healthy, hehe. Thanks Jen! I’m Jordon- I take your classes at Y2, although your schedule hasn’t quite fit mine the past month. I got to your blogs from the Y2 website. I’m in LOVE! Where can I find the overnight oats recipe? hi jordan! thanks so much for your comment. i’m happy to hear you are enjoying the blogs. here is the link to the overnight oats recipe/method: http://www.peanutbutterrunner.com/overnight-oats/.